My love for a graphic tee + cultivating a chic collection has really taken off in the last few months. It's the perfect piece to throw on with almost anything and instantly puts off a cool-girl vibe. However, there's a huge part of my personal style that's so feminine and sometimes that's hard to find in a graphic tee. The moment I saw this one, I loved it. The neutral colors, cursive font, and of course one of my favorite brands, but it felt very feminine meets masculine, which I loved the most about it. 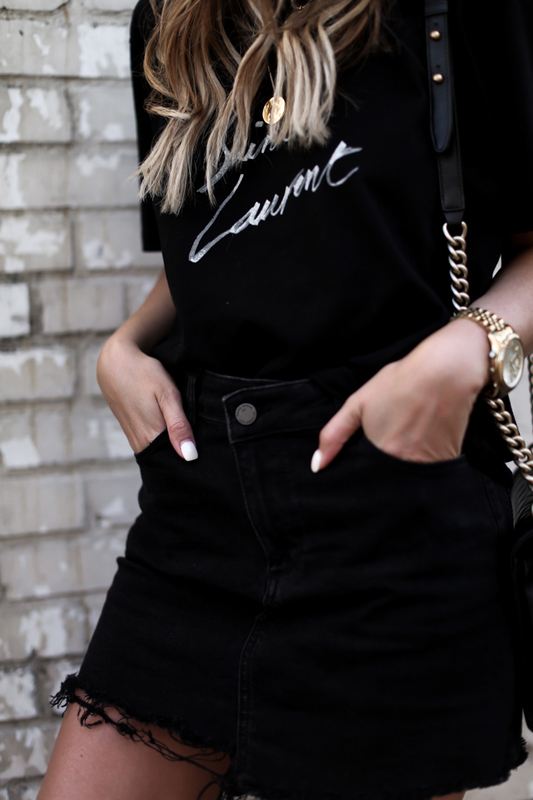 Over the years, I've added quite a few amazing graphic tees to my collection, but only invested in two (this one and one other YSL tee) designer tees that I know I'll wear + love for years to come. However, this outfit can easily be recreated, designer items or not, and feel just as chic. That's what I love about a great tee! I hope you're all having a great week so far! It's been so rainy here since we got home from Europe and I'm so ready for sunshine again! Hopefully this weekend + next week will be beautiful. My birthday is right around the corner and I'm so excited to celebrate all next week! I'll be sharing my 'what I want' for my birthday guide tomorrow, so stay tuned! Oh wow, super edgy and "raw" combo! I'm in love with your boots and tee!